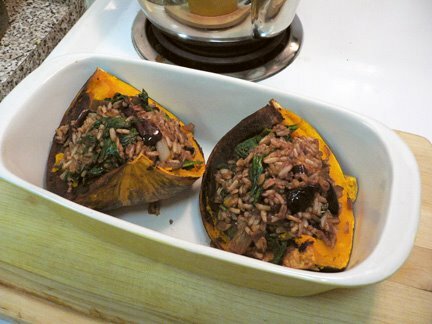 It's winter out there and baked squash will warm you up and and fill you with beta carotene, potassium, and vitamins A and C. This recipe makes great use of leftover cooked rice. Serves 4. Start by baking the squash. Cut in half lengthwise and ever so lightly coat the cut surface and a baking pan with oil. Bake cut-side down at 350 for one hour. When done, scoop out and discard seeds, and cut each half in half to get 4 pieces. While the squash is baking, prepare all your rice stuffing ingredients. Finely chop the onion; crush and chop the garlic; wash and coarsely chop the spinach; crush and coarsely chop the olives; and put all your herbs and spices in a little dish. In a large pan, heat up the olive oil and saute the onion until translucent. Then add the garlic and herbs and spices. Saute for a few mintes and then add the rice. Stir well a few minutes to evenly mix together. Finally add the spinach, olives, salt and pepper, mix well and turn the heat off. You want the spinach to just wilt. Stir in some Bragg's for extra flavour. Hold a squash quarter in your hand and with the other spoon the rice mixture into the cavity. Mound the stuffing nicely. Repeat with remaining squash and place them on a baking pan. Bake for 10 minutes and you're done! Serve with a yummy salad. "Bragg's All Purpose Seasoning" is a wheat-free alcohol-free "liquid amino" seasoning derived from soy beans so it's similar to a very light soy sauce, but is salty without having any actual salt in it. Good for all doshas, especially Kaphas who should eliminate salt from the diet, or to add a splash of flavour to almost any savoury food. Kaphas and Pittas should, in general, consume soy and soy products in moderation. I can say with confidence that this recipe rocks!! It was easy to make and de-lish-us. Thanks for sharing it with us, Claudia.